Elegant Engagements Wedding and Event Planners: Super Sunday! for directions on how to make a Playing Field Tabletop. 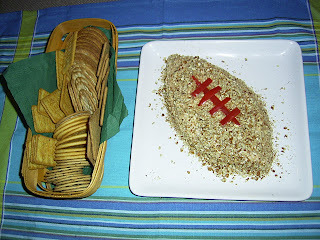 Do you need a fun creative appetizer to take to a party? Here is a picture of what I made last year - it is SOOO easy. I blended cream cheese and shredded pepper jack, formed it into a football shape, sprinkled pecans on top and used red pepper as laces!